A belief in producing quality Australian-made products while supporting local artists and special needs workers underpins this Brunswick company’s business model. “KE Design is a family-run, community- minded business. All our homewares are designed by local artists and produced in Australia with the assistance of our special needs workers,” says Office Manager Virginia Kelly. The business produces tea towels printed with iconic images, like Melbourne’s Skipping Girl and native wildlife, along with gifts and homewares. They also supply microfibre cloths to optical and photographic industries. KE Design is currently the largest customer of Brunswick Industries Association (BIA), employing a minimum of ten special needs workers, or ‘supported employees’, who are trained in the same manner and are fully integrated members of the KE Designs team. The ten-year-long partnership has been extremely successful. The organisation assesses each supported employee’s capabilities and pay level. Warehouse production staff and BIA have regular meetings and correspondence. Some of the workers have gone on to open employment, and the KE Design staff have formed strong bonds with their workmates. Christine Tait, warehouse supervisor at KE Design, says that the company didn’t need to make any operational changes before employing BIA staff. “When we approached Brunswick Industries about contracting their services, they had a team come to assess our facilities. They were to BIA standard, so no changes were required,” says Christine. Virginia suggests any businesses looking to employ special needs workers get in contact with their local Australian Disability Enterprise (ADE) and educate their staff about working alongside differently-abled workers. KE Design has also worked hard to achieve certification with Australian Made. “We are proud to carry the Australian Made logo on all our products. The requirements are that the material must be substantially transformed and at least 50 per cent of the production cost is incurred in Australia,” says Virginia. 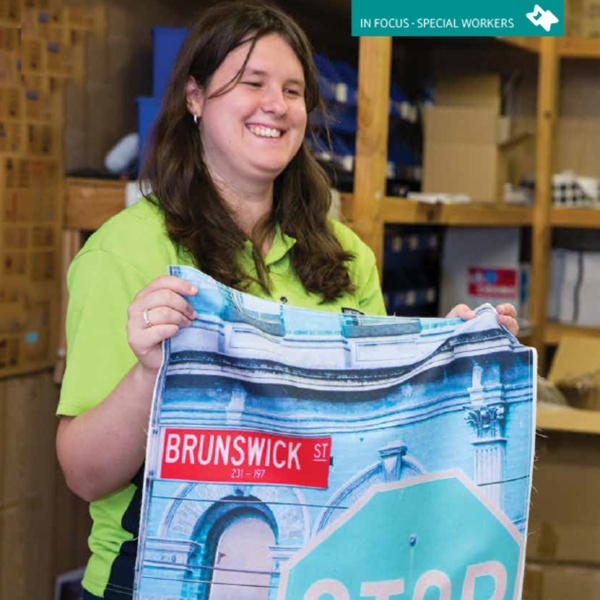 The Brunswick Industries Association (BIA), formerly the Brunswick Sheltered Workshop, was founded in 1968 to assist local people with disabilities by providing them with employment and training opportunities in a supportive work environment. BIA specialises in high-standard production line skills. Over 25 different services are offered locally and interstate, including automated and manual liquid fill operations, warehousing and dispatch services, labelling, packing, assembly, labour hire and forklift operation. It is a competitive business service whose role is to provide services to the business community by a team of people who have a disability and who are capable of providing a quality job on time, according to customer’s requirements.